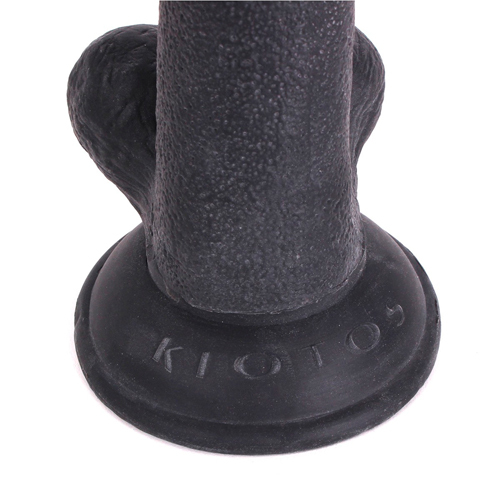 The Kiotos Cox is the latest Kiotos brand line, consisting of 27 Black Dildos. Kiotos COX has a realistic look and feel due to the veins, balls and material. Every COX has a strong suction cup, which means that you can mount your COX on a smooth surface such as a door, bathroom wall or the edge of a bathtub! And yes, the Kiotos COX are all waterproof! Kiotos COX dildos come in different sizes, from 16 cm. to 39 cm. long, all in their own unique blister pack. These amazing dildos are made from 100% high-quality TPE and feel great in you! The soft and flexible material ensures that you have a long-lasting and realistic experience with every use. Kiotos COX can be used with Kioto's water and silicone-based lubricants for an even smoother experience. We recommend using a toy cleaner for cleaning, so that your Kiotos COX will be hygienically clean for the next use. The entire Kiotos COX collection is 100% phthalate free, odorless and safe for the body. Of course you can find them in the basement of our Amsterdam store with all our other toys or you can order them online. You can check out all these new items below or order them directly. If you want to see all our new items please click here.